My Journey to Fit: Guest Post - My Son, Sam! 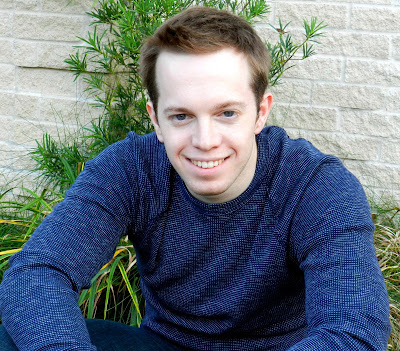 Guest Post - My Son, Sam! I started my "journey" in the very last week of July of 2012. After years of starting and stopping diet/exercise I finally snapped and decided that enough was enough and I needed to take action. I've been big for the majority of my life. 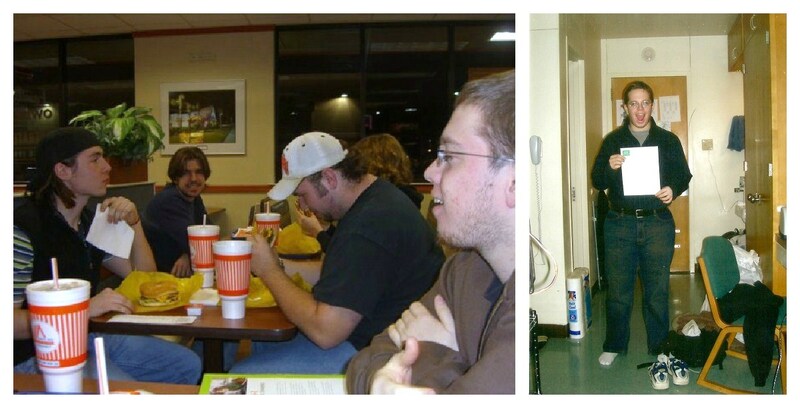 In middle school I was chunky and in high school/college I was fat. I wasn't happy with my appearance but that did not spur me to do anything about it. I remember in my sophomore year of college I was on a gym/diet spree (it started January 1st!). I lost an "ok" amount of weight (I went from 255 to 225). I had no idea what I was doing either. I just ate healthier foods (in part thanks to the healthy cafeteria at school). My gym knowledge was terrible. I just made sure to go three times a week. I did a poor combination of elliptical and weight machines. But what happened? I stopped going. I was pretty consistent for a good two months but that died off very quickly. Once you make the decision to not go that morning, or to start eating unhealthy foods (WHATABURGER I HATE YOU SO MUCH), it become that much easier to do it the next day, and the next day after that. 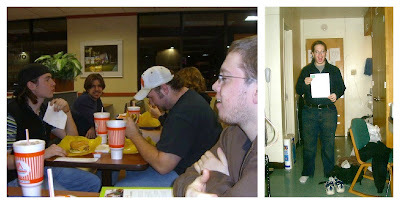 Left: Sam with his college roommates at Whataburger; Right: Sam after he'd lost some weight, sophomore year. From then on I didn't really do anything. I went back up to the 250 range (I think 260 was my highest) for the next four years. I wasn't miserable but I was pretty unhappy with myself. Every once in a while I would run or workout for a week and then would stop. I don't know about most of you, but the "start and stop" process of diet/exercise got really old. Left: May 2010; Right: Christmas day, 2010. In May of 2011 I graduated college and started working full-time as a technical trainer. My job has me travel 85% of the year. Usually I leave Sunday/Monday and come back Friday/Saturday (depending on the class). It's a rough schedule. Couple that with the fact that I have a near unlimited budget for food makes it very easy to over-indulge. Because the job has me on my feet for most of the day, I did not gain as much weight as I thought I would. I wasn't any healthier though, that's for sure. In fact, my heart rate and blood pressure were generally high (stressful job and terrible diet) and I felt fairly crummy. I had enough energy to do the job and that was it. With the combined work schedule and bad eating habits, things just kept getting worse. In June I had an infected sebaceous cyst on my chest that had to be removed surgically. I panicked, not because of the surgery, but because I had to be weighed. This was something I've avoided for several years. I thought I would be 280 (I certainly felt like it) but I only weighed 246. Holy crapola that seems like a huge number now. I had the surgery in early July and everything went well. Toward the end of July, I asked a girl out (ok, big motivation to start losing weight) and also was sick of feeling run down and of the way I looked. I thought if my mom could do it, if my dad could run a half-marathon, if countless other people were able to do it, I should be able to as well. So I used that to be the kick in the pants I needed to get started. I went cold-turkey with everything. I do not suggest this. I dropped diet sodas, fast food, carbs, sweets...pretty much everything that tasted so damn good but was terrible for you. I truly believe that fork put-downs are the best way to lose weight. I've heard the saying that weight loss is 80% diet, and I believe that to be true in my case. So if you are worried about gym time and everything else, work on your diet first. You will see big changes! Favorite foods include 99% fat-free turkey, avocado, sweet potatoes, steam-fresh vegetables (non-frozen kind, you can find these near the salad section in most grocery stores), chocolate roast/cinnamon roast almonds, oats, Optimal Nutrition Whey (cookies and creme tastes pretty great, same with strawberry), mustard (for my turkey meal) and natural crunchy peanut butter. I'm a creature of habit so I end up eating lots of the same thing over and over again. I don't mind, but I do try and spice things up a bit every once in a while. Now, not only did I change my diet, but I tracked everything. In fact it was the tracking that got me on the right path. I used myfitnesspal.com to do it. It's a great app. I loved scanning all of my items and it really opened my eyes to how many calories I'm putting in my system. This is probably one of the greatest tools I've used in order to lose weight. Along with the massive change in diet, I also wanted to go to the gym. I decided to join 24-Hour Fitness since I have one that's pretty close to where I live and I also can use while I travel. I became interested in weight-lifting, and after reading online I decided to try a program called Starting Strength. This is a basic barbell training program that has you do only compound lifts to gain strength. After my first week on this I wanted to die. My chest hurt so bad I could barely move. But after a couple weeks of going it got better and better. This is what I am still doing today and I still love it. It's intense (the weight is very heavy) and I feel like I had a great workout after I'm done. Not only has this been great for fat-loss, but I've put on some decent muscle too. I have biceps! I have quads! I have pecs! And I can do pull-ups (never in my life could I do those)! I've also taken up running (because if my parents can do it, I should too!). I'll try to get in 2-3 runs a week at around 2.5 - 4.5 miles. I want to do a half-marathon this year so I’m starting to run longer and longer distances. So far, running has been great. I also try to swim/bike at least every other week with the running. My endurance has shot up tremendously from this. I can run! I'm not winded going up the stairs! I don't sweat all over the place! I've stuck with this for quite a while with very few cheat days. Sure, there are times when I couldn't get to the gym or when I was sick. Sure, there are times when I eat a little bit unhealthy. But I haven't gone crazy when it happens. That has been a huge factor in keeping the weight off so far and sticking with the program. I am in control for the first time in my life. If I want a piece of pie, I’ll have it and fit it into my diet. It's an awesome feeling being able to do that. This has completely changed my life. 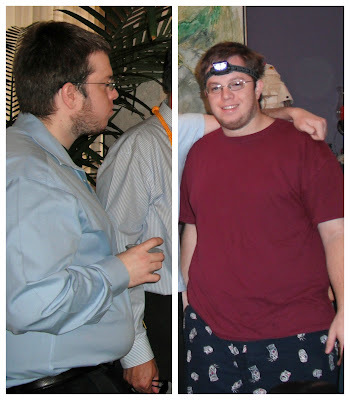 In the short amount of time I've been doing this, I’ve lost 73 lbs. I now weight 173 lbs and have never felt better. 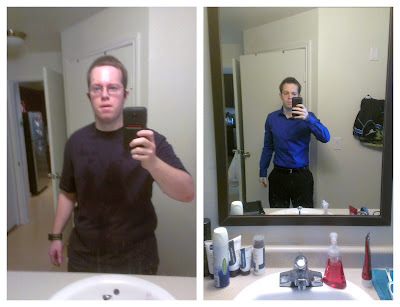 I dropped from size XL to medium in shirts and size 42 to 32 in pants. I have more confidence and more energy. I don't feel lethargic. It's hard work doing this but the benefits are HUGE!! I'm kicking myself for not doing this sooner...if I would have known I'd feel this good with some life changes, I would have done this years ago. November 2012...looking mighty sharp, my son! Oh my gosh, Sam looks great. He looks so healthy and happy. A very inspiring story! Sam, thanks for sharing. What an amazing story and congratulations with your huge weight loss. You look fantastic and handsome. I love it that you see your Mom and Dad as an inspiration. That's what parents should be for their children, right? 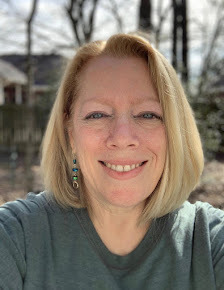 I've been reading your Mom's blog for almost 4 years now and I find it great that you have done this guest post on her blog. Stick to your new lifestyle, it's doing you good. Wow, what an amazing transformation and so inspiring! Congrats to you! Awesome! Way to go Sam. This is a great post. The whole Shelley family is inspiring. WOOT. Thank you! I LOVE LOVE LOVE LOVE LOVE LOVE THIS SHELLEY!!! That is so great! The joy he feels ABOUT HIMSELF leaps off the page. I loved his post but one question nags at me....did the girl go out with him? IF she didn't, I bet she is kicking herself now!!!! His positive attitude is a great reflection on you, Shelley. What an amazing story!!! Thank you for sharing it with us. Congrats Sam, it feels great doesn't it! And to your parents, they are such a great example of what parents should teach their children. Love that you think of your parents as an inspiration, because even though I don't know your mom personally I feel the same way about her! Congratulations, Sam! You've done great - but how could you not with your mom for a role model. "If I want a piece of pie, I’ll have it and fit it into my diet. It's an awesome feeling being able to do that." That's my mantra for 2013 - "moderation." I like that I control what I put in my mouth, rather than the other way around - nothing is off limits. Before I would say "I am not going to drink wine, chocolate, pretzels, etc." And guess what? I craved wine, chocolate and pretzels! Now that I CAN have them I don't WANT them. Crazy! You have made your Momma proud - and you should be proud too! Thanks! As long as it fits my macros I'm ok with it. There are still some things i'll avoid because I think it will make me feel sick (like greasy chicken fingers/fast food), but that's more a personal choice instead of a restriction (at least to me it is). Thank you so much for sharing your story, Sam! Though I went about my "journey" a little differently, so much about the way you felt before and attempts you've made before this one really resonated with me. I kept trying to jump start a gym routine after New Year's, year after year, often visiting the gym on-campus in college for a few weeks, then tapering off and not going. And eating crap along the same lines as Whataburger. And even as recently as a couple years ago, my gym visits were elliptical and weight machines too, and I had no clue how to do anything that would actually be effective. I'm glad you found something that worked for you! I think logging what you eat seems to be a key for a lot of people, because it really helps you see exactly what/how much you're eating. Do you plan to lose any more weight, or do you have a plan for maintenance? My unsolicited advice as having a few years on you (I'd guess at least 5?) is, now that you've lost all this weight and gotten into a healthy lifestyle, keep on doing what you're doing! I lost a lot of weight and gained it all back several times throughout my 20's, which is heartbreaking and frustrating, and each time I try to lose weight as I get older, it gets harder. But it sounds like you have a good attitude and a good idea about how to stay healthy, and you definitely have awesome role models and support with your parents! Yeah it's tough to start and stick with it. Finding something that I've enjoyed was key. The logging, as you say, really helped too. I had no idea what I was eating. 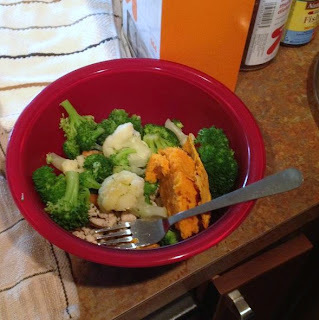 I didn't necessarily eat bad foods all the time, but my portions were very large. This got me on track. I like tracking too because it satisfies the internal engineer in me (numbers!). Right now I am following a -25%/+10% plan. I eat 10% over my TDEE on lifting days, and 25% less on my non-lifting days. I'm losing my lean muscle and fat. I don't really want to decrease too much (maybe to 160-165), but my overall goal is to put more lean muscle on and drop my BF%. Well, I see you don't totally take after your mother what with your percentages and TDEE and all that. I know she read that comment and thought, "bloop de bloo." Haha, so true...my eyes glazed over when he hit the percentages! P.S. Obviously Sam's math and engineering skills did not come from me...did I really even need to clarify that? Sam, I'm a nerd on tracking things too (oh sorry, I guess I read "engineer" that way :-)! I think that's why it's so effective for me, it's so satisfying to see all the numbers! I do the same thing with calories burned, and it's a huge motivator for me. Oh Helen you know my wife so well. Why yes, yes I do Jeff. That would be why we are BIFs! Sam, you, like your Mom, are an inspiration! Thanks for sharing your story with us!! Congratulations on your success! I keep telling Shelley that too Lori! I totally see him in a Macy's flyer lol! Thanks so much for your post, Sam. Totally engaging, inspiring and motivating. You are a quadruple threat (see Helen's comment) and you may be fielding calls from modelling agencies! Congratulations on your great success. Shelley----You have to be one proud mamma! 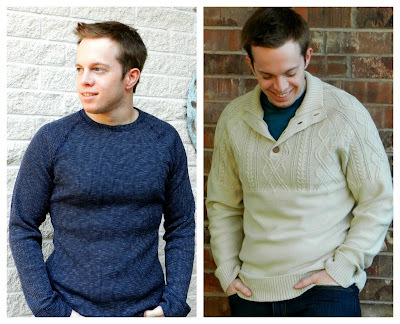 What a fabulous thing to have son guest post on Mom's blog. I love it! So I wouldn't be me if I didn't ask this: did you feel the need to address any emotional issues around food/weight? You know, not really. It's nice not being as big anymore though. That was a real bummer. Food, no real emotional issues (I did tend to eat when stressed/sad). But there was no "ah-hah" moment during the process. Weight was a bigger emotional issue. Just sucked being so large. Didn't even realize it until I saw pictures. I knew I was big, didn't think I was THAT big. Much better feelings now. I also use My Fitness Pal, and have currently lost 36 pounds (with a lot more to go!) I've found it to be a great help to me. I know you are proud of your boy - you've set a great example! Thanks so much for sharing Sam! I see you and your family being so active together and often wished I had that when I was your age. I probably gained the most weight in my 20's when socializing meant drinking and eating constantly. Travel is even harder! Congrats to you. You look awesome and just like your mother, will continue to inspire others! What a great job Sam!! Thanks for sharing your journey Sam!!! Great inspiration!! Shelley--you must be so proud and happy for your son! Looking good, Sam!! Yeah!!! Great story - your son looks great!!! WOW! Great story! He looks incredible! Thanks for sharing! Wow wow wow!!! You look fantastic Sam! Amazing transformation. I know your mom and dad are so proud of you. So very inspiring. Its what so many of us need. Thanks for sharing your story Sam. And Shelley, thanks for letting him do so! Congratulations, Sam! I showed your pictures to my daughter. Her response: "Daaaang!" (That's good.) Keep up the great work! Shelley, I know you are one proud mama. I am sure you feel wonderful that you have been a good influence on your son. Woohooo, good for you, Sam. I know just how tough that is. Now you definitely want to follow your mom for her maintenance tips -- she knows how to keep the weight off! What a great post! And Shelley, your son is quite the little cutie! Keep up the great work, Sam! Oh the "thanks" to mom and dad were wonderful :) Loooove it! Great job Sam! You look great and I signed up for a MyFitnessPal since you recommended it. I put in the workout I did today along with what I ate. I am going to check out Starting Strength website too since you recommended it.